Steven Zhu, who heads the Chinese Restaurant Association in Philadephia, with Ling Lin, who says she closed her restaurant after repeated police visits and fines, even after a judge agreed she was open legally to serve late-shift hospital, nursing-home and airport workers in her Southwest Philly neighborhood. 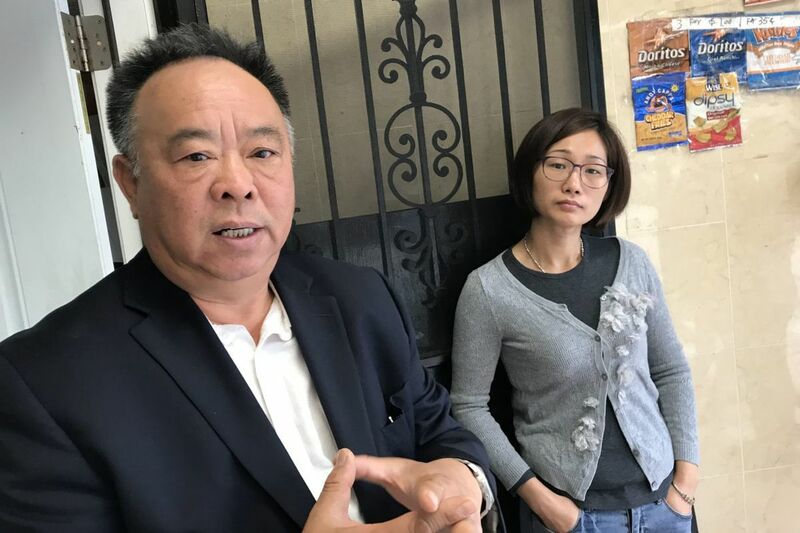 Members of the Chinese Restaurant Association in Philadelphia say city records show they are disproportionately targeted and fined for staying open after 11, and are treated as if they are in residential neighborhoods even when they are in business districts. West Philly neighbors saw an opportunity, Mei Ying Luo says, when she and her husband opened a mini-market two blocks north of the 52nd Street El stop, under their apartment, next to a hair salon. "They are working people. They come back late, from the hospital, from a lot of jobs," she told me in the tiled lobby of her business, Grace House. "They told us, 'We really want to get hot food.' They only had one Chinese restaurant around here. They signed a petition. It took a long time to get the license. We fixed everything to make it nice. My friends helped." They opened their takeout place in 2011, and were promptly slapped with the first of dozens of tickets for violating the city's 2005 11 p.m. closing law for businesses on residential blocks. They were puzzled: The law exempts blocks that are at least 20 percent commercial. "There are businesses all along 52nd Street," noted Steven Zhu, president of the 300-member Greater Philadelphia Chinese Restaurant Association. The couple used that to win a 2014 decision from Municipal Court Judge Bradley Moss confirming the restaurant was open late legally. That didn't stop police. "They come in here so angry," Luo said, with the aid of an interpreter, of officers who slapped Grace House with violation notices 14 times last winter alone. "They make all the customers leave" without food. "I say, 'I'm not the bad guy! We are a service to the neighborhood! Why don't you help the victims, the people who are being robbed?' The officer says, 'My job is to write tickets. I don't care if you go to court. I'll keep coming till you close.' I got so angry! I can do nothing." She wept. Mei Ying Luo says her famlly business, Grace House on 52nd Street in West Philadelphia, has been repeatedly slapped with fines for staying open after 11 p.m., even though the shop is in a commercial strip where late-working residents petitioned her to add takeout to her former deli. Another business owner, Ling Lin, told me she closed her Good Luck Restaurant on 60th Street after piling up tickets, even though it, too, was located in a mixed commercial area. Police ordered her customers away and declined to acknowledge a judge had agreed her store was open legally. Lin told me she loves Philadelphia, her friends across town, her kids' charter school. But they are growing up afraid of police. Lin's Chinese restaurant was one of 27 hit with multiple fines over the last 2 1/2 years — while nearby pizza, fried chicken and doughnut joints and delis that all advertised staying open past 11 were not cited, according to city records compiled by Councilman David Oh's staff and submitted in a report to City Solicitor Sozi Pedro Tulante last month. Oh earlier documented that more than 90 percent of the businesses fined under the ordinance in fiscal 2015 and 2016 were Chinese takeouts. The study "raises important questions, including the possibility of race-based enforcement," the city solicitor acknowledged in a Sept. 15 response to Oh. But Tulante added he believed police officials who told him that a "change in Department policies" has lately resulted in "no discriminatory enforcement," adding that he expects none if "current Department policies" continue. The Police Department "is not currently enforcing the law," confirmed city spokesman Mike Dunn. City Council, the Department of Licenses & Inspections, and the city managing director's staff have been meeting "to find a balance between the needs of the community and the merchants," he added. Even after Tulante's letter, the Chinese Restaurant Association said, members on mixed blocks of North and West Philly were hit with late-night code violation notices. On Sept. 30, it was No. 1 Chinese Restaurant at 50th and Ogden, across from James Rhoads School. On Oct. 3, it was Imperial Garden in the city's Hunting Park section, on Sixth Street between an AutoZone and a hair salon, with rowhouses behind it. Oh wrote back to Tulante, complaining that despite the city's claim that "the Police Department has temporarily stopped the enforcement," there has been no "official documented change" in city policy and "the evidence of discrimination is clear." Restaurant-association president Zhu said some Council members seem sympathetic to the owners — he noted that Chinese restaurants in Councilman Mark Squilla's district and in most of Northeast Philadelphia haven't been cited — but his group is frustrated the law hasn't been revised. "We do not see evidence" of "racist and systemic targeting," but Council President Darrell Clarke has signaled support for a proposal to reduce the fines, Jane Roh, Clarke's spokeswoman, told me. That's not enough, Oh said. He has drafted a proposal that would have L&I, not police, decide which blocks are "residential." He wants to see neighborhood takeout, pizza and fried chicken joints shut at 11 equally, or not at all.